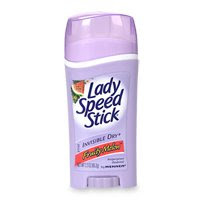 i'm very loyal to Lady Speed Stick and noticed something was off. i was always happy that my fav brand just coincidentally happened to be one of the more affordable ones (lets save those pennies for shoes n junk) but it was $4.49 today. wasn't it always like $2.99? i used to be a lady speed stick girl, but then i made the switch to secret. prettier scents! but secret allows you to sweat! I totally agree with you...SDM is a huge rip-off establishment. My brand is "Arm & Hammer Advance"...I usually make my purchases at the Superstore (Loblaws) or Wal-Mart. I was in a position where I need to replenish my supply and I was forced to hit up Shoppers Drug Mart. I usually pay $2.79 or less...SDM was selling the exact same brand and size for $3.99...before tax. I nearly lost my mind...eff Shoppers. when i worked at shoppers, they told us that the reason why they are a little more expensive is because you get customer service there, whereas you won't at walmart. walmart's prices are almost the same as shoppers' cost price.